If Batman Begins can be seen as primarily (and wonderfully) successful in exploring the roots of the Batman, its successor chooses a different tack entirely. The Dark Knight takes the audience into a dark and malevolent underworld of corruption and manipulation that will stain the soul of even Gotham City’s purest, leaving Batman unrecognisable from his foes. It’s also a hell of a ride. Batman (Christian Bale) has continued his one-man crusade to clean up the streets of Gotham City, but into the void left by the loss of Carmine Falcone as crime kingpin must rise others to take his place. A loose coalition of gangsters now exists, but even their hold on business will be shaken to its core by the arrival of The Joker (Heath Ledger). With a crime spree stunning in its ferocity, The Joker targets the figureheads and rallying points for the side of the law, including District Attorney Harvey Dent (Aaron Eckhart), Lt. James Gordon (Gary Oldman) and Assistant D.A. Rachel Dawes (now played by Maggie Gyllenhaal). The stunning impact of a film such as The Dark Knight is hard to capture, and can be truly understood only by experiencing it. Director Christopher Nolan takes his characters on a hell-ride, with twists and turns that mean every one of them must question themselves. Batman is relegated to reactionary where once he was two steps ahead of the game, while The Joker conducts an orchestra of gaudy explosions and subtle manipulation that leaves everybody guessing. It is remarkable that Nolan would choose to reduce his main character in such a way, but The Dark Knight is all the more powerful for his doing so. Of the additions to the cast, Eckhart stands out in the role of tragic hero, a role his strong but good mien is perfectly suited to. Dent is a true believer, and to witness The Joker pull him this way and that in his attempts to destroy him is to watch his very being stripped to its core. Although Eckhart occasionally waivers – particularly in later scenes – for the most part his performance is spot on. Gyllenhaal is given more screen time than Katie Holmes had in Batman Begins, but the subplot dealing with her emotional conflict never quite takes flight. The remainder of the cast returns from Batman Begins, and all perform adequately without being spectacular. Michael Caine, Morgan Freeman, Oldman, Bale… all bring their best to their roles without ever being able to get out from beneath the enormous shadow cast by their castmate, the late Heath Ledger. The early word has Ledger hot for a posthumous Oscar, and it is incredible to finally witness his performance after so much anticipation. Ledger burns with such incandescence, such power and brutality, that his turn will leave many asking ‘Jack who?’. 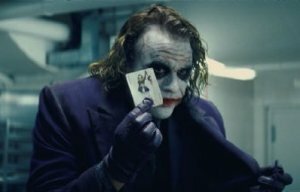 The Joker in Ledger’s hands becomes a true sociopath who gives no clue as to what really drives him. Nolan flirts with explanations throughout the film, however, telling different stories of tragedy and abuse that mean the audience will never truly know or understand where he came from – in many respects this makes him all the more scary. Ledger is fearless in the role, and his performance guarantees The Joker will be remembered as one of the all-time truly evil screen characters while hinting at the great loss the cinema world has suffered. Who knows what he may have accomplished after his breakthrough roles in Brokeback Mountain and now The Dark Knight? There is little to complain about in a film of such skill and power, however The Dark Knight could perhaps have been edited to a slightly shorter running time. As it is it’s like a marathon with no reward for finishing – Nolan grabs his audience by their throats from the first scene and never lets up, with exhaustion being the end result. 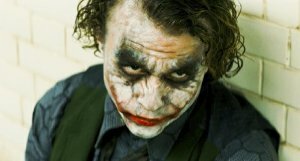 What Nolan has achieved with Batman Begins and now The Dark Knight seems remarkable when looking back over the comic book adaptation genre that has spawned so many failures and cheap attempts to capitalise on the computer-assisted filmmaking revolution. The true star is Ledger, however, and we can all hope his performance is adequately recognised. Vale Heath. Stuart talked about The Dark Knight on the Reel Chat podcast. This entry was posted in Film Reviews and tagged Action/Adventure, Comic Book by Mark Lavercombe. Bookmark the permalink. Exhausting would be an appropriate adjective for The Dark Knight. Christopher Nolan’s newest opus is filled to the brim – not a single second is wasted. Batman Begins was a perfect film, and whilst The Dark Knight doesn’t quite reach the same heights, it is extraordinarily powerful. Never has being a hero seemed so complicated – Bruce Wayne’s woes make Peter Parker’s problems look pitiful in comparison. I agree with Mark in that we’ve never seen a superhero being put through the wringer quite like this. The film works devilishly at weaving its way inventively through every superhero cliché we can think of but comes out the other side so much more. I can’t even describe the kind of mayhem unleashed by The Joker. Heath Ledger’s performance is unflinching, unselfconscious and incredible, and his villain is truly terrifying. It makes Nicholson’s Joker look like he’d just been sacked from his role in the local pantomime. Aaron Eckhart is great as Harvey Dent, though his character’s arc is possibly the most difficult to tackle. The returning cast are in fine form – Bale is excellent; and Caine, Oldman and Freeman manage to make us forget who they really are, no mean feat with such pigeonholed and instantly recognisable actors. Maggie Gyllenhaal, unfortunately, has nothing to work with. At first her performance seemed to too keenly mimic Katy Holmes’, but soon I realised that Rachel Dawes simply doesn’t have enough to do in this film. One could blame the genre, though writer Jonathan Nolan failed to provide a strong female character in The Prestige also. Gotham is apparently a city of men, and after two films it’s starting to wear a little thin. The Rachel subplot is one that falls to the wayside, and is indicative of a film that tries to do just that little bit too much. As Mark said, it could have done with some trimming. It never gets boring, but it’s simply too much to take in. If anyone suggests that this is just another popcorn flick (as some did with Batman Begins) I’m going to do my best to knock the future out of their mouth – this film is anything but an audience pleaser. It does have its fair share of action, but once again it’s only a tiny aspect of the overall production. The Dark Knight is much more about the symbol than the violence – so much so that Batman’s first scene in the film feels tacky and unnecessary. This is an amazing film. 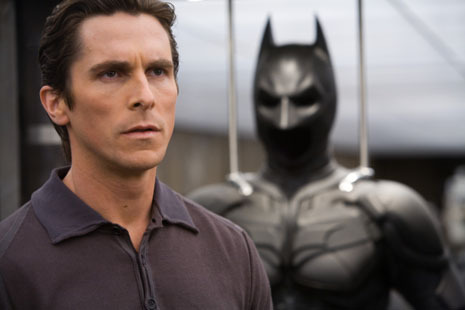 Once again Nolan has managed to create not just a superhero flick, but one that proves blockbusters needn’t be idiotic.